This post covers the supported SCCM deployment types when you create an application. In my blog, I have posted numerous posts on application deployments using SCCM. SCCM is the best tool when it comes to deploying applications to computers and users. At the time of writing this post, SCCM 1902 is the latest version. SCCM 1902 has got several new features and improvements over previous version. To upgrade you Configuration Manager to current branch version 1902, refer this upgrade guide. When you use Configuration Manager to create an application, it needs at least one deployment type. An application can have more than one deployment types. I will cover some application management basics and then we will see the deployment types. Before we jump on to deployment types, let’s try to understand some terminologies related to application deployments. You will hear them very often if you are new to SCCM and application packaging. Application – An application contains one or more sets of installation files plus instructions on how to deploy the software. The applications sit on top of systems software because they are unable to run without the operating system and system utilities. Application Deployment Type – If an application is available with you, it needs at least one deployment type, as it determines how to install the app. With SCCM, you can use more than one deployment type to configure different content and installation program for the same application. We will see deployment types in next section. Requirements – While you plan to deploy applications, you may specify requirements to ensure you target the application to right devices. For example, your organization contains a mix of Windows 7 and Windows 10 OS. The app that you want to deploy is compatible with only Windows 10 OS. Hence using requirements, you can specify the app installation to occur only on Windows 10 OS. Configuration Manager verifies these requirements on devices before installing the deployment type. Global Conditions – Global conditions are a library of predefined requirements that you can use with any application and deployment type. Configuration Manager includes a set of built-in global conditions, or you can create your own. Simulated Deployments – In Configuration Manager, when you create an app, you can perform simulate deployment. A simulated deployment evaluates the requirements, detection method, and dependencies for an application. A client reports the results without actually installing the application. Check this post where I have covered about simulated deployments. Deployment Action and Purpose – Deployment action is either Install or Uninstall the application. You must specify whether you want to install the application or uninstall it. Furthermore there is a deployment purpose. The deployment purpose is either Available or Required. Detection Method – Using detection methods you can discover whether a device has already installed an application. If the detection method indicates the application is installed, Configuration Manager doesn’t attempt to install it again. Supersedence – Using Supersedence, you upgrade or replace existing applications by using a Supersedence relationship. If you have an latest version of app, you specify a new deployment type to replace the deployment type of the superseded application. Dependencies – Dependencies define one or more deployment types from another application that the client must install before it installs this deployment type. 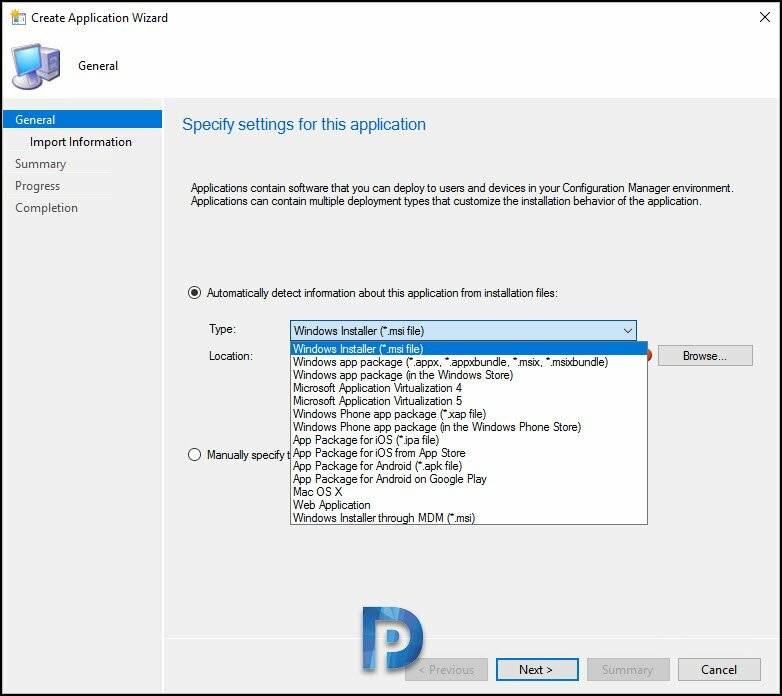 When you create an application in SCCM for deployment, you see several options. Out of many options presented, we hardly use all of them. Windows installer deployment type is widely used. However it is important to understand what those application deployment types are and where can it be used. Windows Installer *.msi file A Windows installer file. Windows app package .appx, *.appxbundle, *.msix, *.msixbundle Applies to SCCM 1806, and above. These are Windows 10 app package (.msix) and app bundle (.msixbundle) formats. Mac OS X .cmmac Use this option to create app for Mac. Requires .cmmac file that can be created with CMAppUtil tool. Web Application Using this option you can specify a link to a web application. Windows Installer through MDM *.msi Select this option to create and deploy .msi apps to Windows 10 devices.